Orlaith O'Sullivan's blog on mindfulness practice, with tips and help on how to incorporate mindfulness at home, school and work. This is one of my favourite mindfulness practices. From kindergarten to the boardroom, all ages can connect with this simple, calming movement. This practice is recognized by mental health practitioners as an anxiety reducer. Starfish can help the challenges that we face at any age - whether youтАЩre over-excited about a birthday party, bored in the boardroom, or worried in the middle of the night. It helps us unhook from strong emotions and addictive thinking, and come back to our body in this moment. We offer calm and peace to ourselves, and gain space around a difficult thought or feeling. Choose a hand to be your starfish, and a finger to be your breath pointer. Start below your thumb, down at your wrist, and wait for your next in-breath. As you breathe in naturally, trace your in breath carefully up your thumb with your finger. You need to time it so that youтАЩre at the very tip of your thumb when your in-breath becomes an out-breath. Let your breathing be totally natural. Your tracing finger is simply representing the breath along your hand. Breathe down your thumb for your out-breath, so that youтАЩre at the very base when your out-breath becomes an in-breath. Remember тАУ no messing with your breath! Simply speed up or slow down your tracing finger. Breathe up and down each finger, with care and deliberate focus. Let yourself rest in the sensation of movement тАУ your lungs breathing and your finger moving. As you breathe down your little finger, rest at the base of your wrist for a moment. Check in and see how youтАЩre feeling. Simply notice the feelings тАУ thereтАЩs no need to judge or explain anything. YouтАЩre just looking. Settling at your wrist, wait for an in-breath and repeat the process, leisurely tracing your breath up and down your fingers, in and out. Pause again at your wrist. How are you feeling? Again, simply notice and label. ThereтАЩs nothing to fix. Once you have learned Starfish, your body can respond very quickly to the practice, immediately settling in to the sensation of breath and touch. We learn that this is an appropriate moment to rest in our body and focus on ourselves. You can take time to talk about starfish as a group. WhoтАЩs seen a starfish? What colours might they be? How many legs do they have? Does anyone know any interesting facts about starfish? You can listen to each otherтАЩs experiences and ideas, and also draw your own starfish. This catalyzes our imagination, and helps us to view nature (and ourselves) with compassion as we learn this exercise. (2) What's in a name? This practice has lots of different names, including 'finger breathing'. 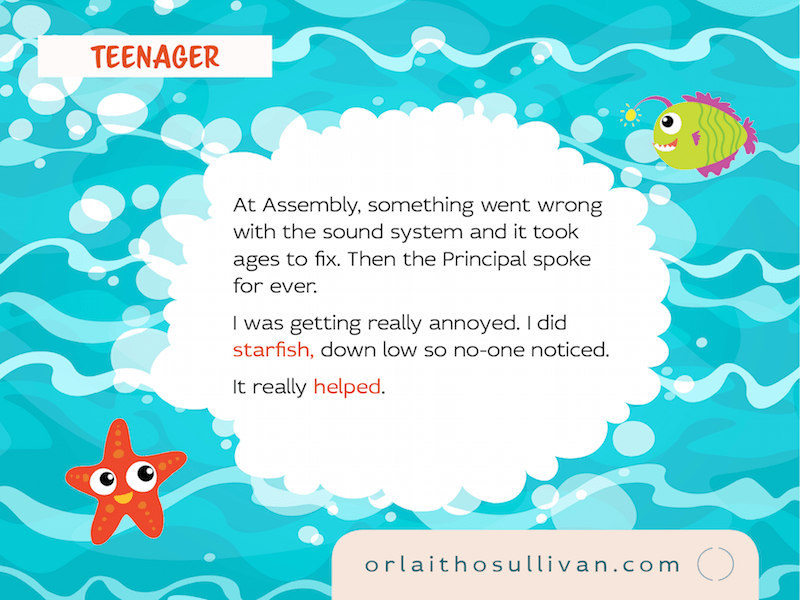 When I'm working with teenagers, 'starfish' may sound a little childlike, and I usually call it 'tracking your breath'. You can also do this as 'Mountain', where your outstretched fingers form a mountain range that your finger will climb up and down. ItтАЩs nice to imagine our fingers as the petals of a flower, which we trace in all its loveliness.